I’m sleeping. Rowan gently slaps my forehead in a way only a four-year-old boy can. It’s almost a caress. Almost. Then he explains the plot of our pretend game. Usually, the ninja tries to attack Ben with a sword that shoots lightning and Ben has to defeat him. Sometimes evil monsters try to drag him down into the lava pit (see below). Or bad alien robots from outer space shoot invisible lasers at him from the sky. Or on especially exciting mornings, all of the above. The green chair beside his bed is his spaceship. The closet is the ninja’s castle. The carpet on the floor is the monster’s house – alternately a deep dark pit, a lava flow, or a deep dark pit filled with lava. Boys love monsters. And aliens. And robots. And ninjas. Why? I haven’t a clue. 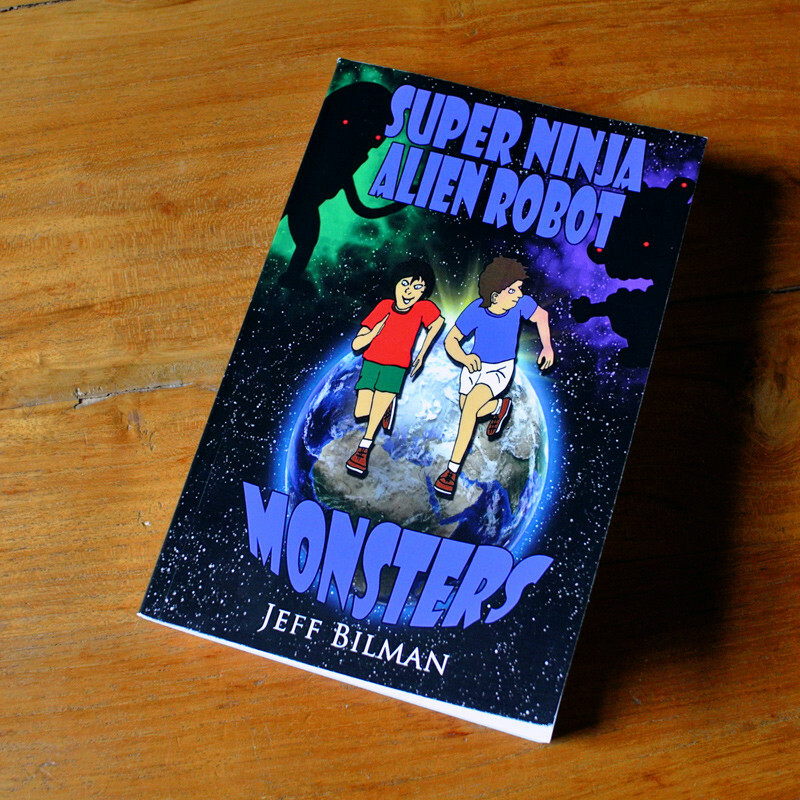 When our friends told us about Super Ninja Alien Robot Monsters (amazon.ca / amazon.com), by Jeff Bilman, we knew we had a winner for the little guy. I read it first, partly to see if we could read it to Rowan now, and partly because I love a good kids’ fantasy story. Bilman’s book is hysterically funny. Kids will love the fact that the two main characters, a ten-and-a-half-year-old boy, Matt, and his “noodle” of a younger brother, Jamie, are trained ninja fighters who get to fly amazing super-charged robot suits into space. Their top-secret mission? To defeat the Super Ninja Alien Robot Monsters (SNARMs) from Alpha Centauri and the curious little beady-eyed aliens who want to destroy the earth. The story evolves easily for kids in the eight to ten-year-old range. From Matt being picked on in school at the beginning, through the skills and lessons he learns when he fights five different SNARMs, each with its own personality, terrifying strengths, and funny weaknesses, to the exciting, feel-good ending that ties the whole story neatly together. As an adult, I laughed out loud throughout the book. I can only imagine what Rowan’s reaction will be when I read it to him in a few years and how thrilled he’ll be to read it on his own after that. I’m sure it will be a treasured favourite. For now, he will have to settle for our early morning pretend alien robot monster ninja games. Although, Bilman has given me some interesting ideas for upgrades to the version we’ve been playing. Maybe a few rocket missiles and laser canons are in order. Or perhaps a pink Lycra bodysuit and some yellow chicken-feet slippers. Just to shake things up.